Here's what the Senate EHEA Committee saw before a majority voted SB1089 down. Thanks to Senators Shirley Nathan-Pulliam, Johnny Ray Salling, Bryan Simonaire and Ron Young for protecting our kids from being harmed in school. Montgomery County Attorney questions MSDE claims regarding safe use of digital devices. 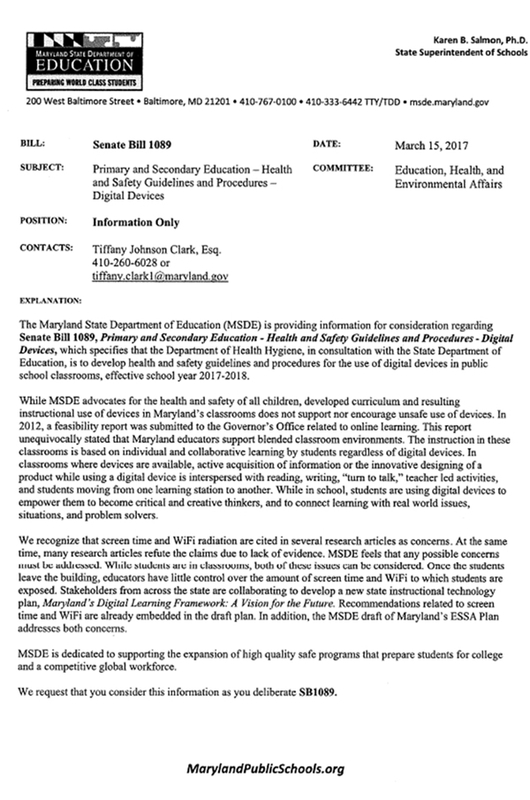 MSDE letter regarding SB1089, is below. According to Tiffany Johnson Clark, Esq., the MSDE draft of Maryland's ESSA Plan addresses issues surrounding the amount of screen time that public school students will have on digital devices. In my review of THE DRAFT DOCUMENT, I have not been able to find the specific section that addresses the amount of screen time that students should be on digital devices while in public school classrooms. Can you please assist me in locating the section of the draft that speaks to this issue? We believe that this representation from Ms. Clark has been used to influence the votes of members of the Maryland legislature on a bill that seeks to address this very issue. In an effort to provide the legislature with accurate information, we would like to have the specific citation to where the issue of digital device screen time in public school classrooms is addressed in the draft ESSA Plan. Thank you for your expert assistance. The Maryland State Department of Education (MSDE) believes there is little proof of harm to our children as a result of using digital devices in school every day. This, despite the entire medical community underscoring serious medical risks. Both the Maryland State Medical Society and the American Academy of Pediatrics Maryland chapter strongly support this bill. Read on... written by the chief ed tech proponent in the school system... signed by the MSDE legislative representative.